Here I am ready to turn the heel. Knitting the leg of the sock on one needle has been enjoyable so far, the next part will be the test. If I can successfully turn this heel, the sock will get a mate. If not then I shall be content to wear one sock, a colorful and pretty sock nonetheless. Wish me luck in my heel turning journey and hope for a mate to be born! 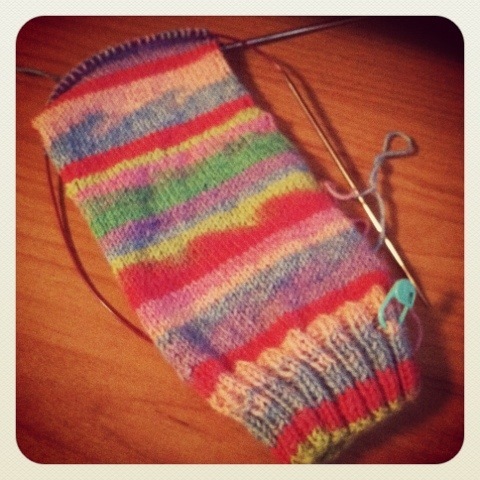 This entry was posted on Sunday, February 12th, 2012 at 4:58 pm	and tagged with Knitting, Socks and posted in Instagram, Knitting, Photos. You can follow any responses to this entry through the RSS 2.0 feed. I figured as much and I have decided to knit the 2nd sock to the same spot and do the heels together. I am finding even doing the 2nd sock is going much faster now that I have knit one. I am kind of looking forward to having them done.